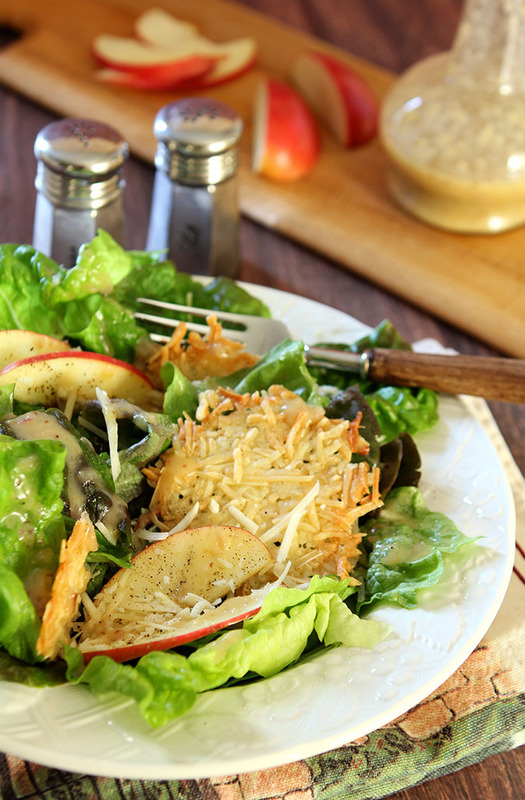 This Red Leaf Lettuce and Apple Salad with Parmesan Crisps is light, easy to make and absolutely delicious. I remember vowing that I would be sharing more salads didn’t I? The thing with salads is that I so often just throw one together; including the dressing, and then after the fact the next day have to not only recreate it for a photo but first things first…I have to remember exactly what I used. I haven’t bought a bottled salad dressing in years preferring to grab things from the fridge and the pantry and often make something as simple as olive oil, balsamic vinegar and whatever the spirit moves me. Blogging about it is usually not on my mind…until after I’ve enjoyed the results! Luckily I had this recipe for Red Leaf Lettuce with Apple and Parmesan Crisps covered. This salad is my version of a recipe I saw in a Bon Appetit magazine from last year so I just had to make a couple of notes during preparation. I’ve made some major changes; red leaf lettuce was perfect and a trip to the grocery for specialty lettuces really was not necessary. I’ve changed up the dressing quite a bit too. I wanted garlic and decided to saute it and the shallots to mellow them a bit and this dressing was so good I can only recommend that as an absolute necessity. This was simple and absolutely fantastic.Despite my changes, it has the same spirit with the apple slices and Parmesan Crisps and it is an absolute winner. I’ve made Parmesan Crisps before and wonder why I’m not making them every single day of my life and then I eat them up with such abandon that I answer my own question. I would be rolling around like a Parmesan wheel! Apples and Parmesan cheese, especially slightly melted and crispy Parmesan cheese. Really how could this be wrong? On a baking sheet using either a silicone mat or parchment coated with nonstick spray, divide 4 oz. grated Parmesan into 8 mounds. Press with your fingers to flatten. Bake until the cheese is golden and melted, 6–10 minutes. Transfer baking sheet to a wire rack and let cool; break crisps into coarse pieces. Heat olive oil in a medium skillet over medium heat, add the chopped shallots and saute for 3-4 minutes; add the garlic and saute for another minute. Remove from heat and add honey; mix well. Add the remaining dressing ingredients, whisk together and allow to cool down. 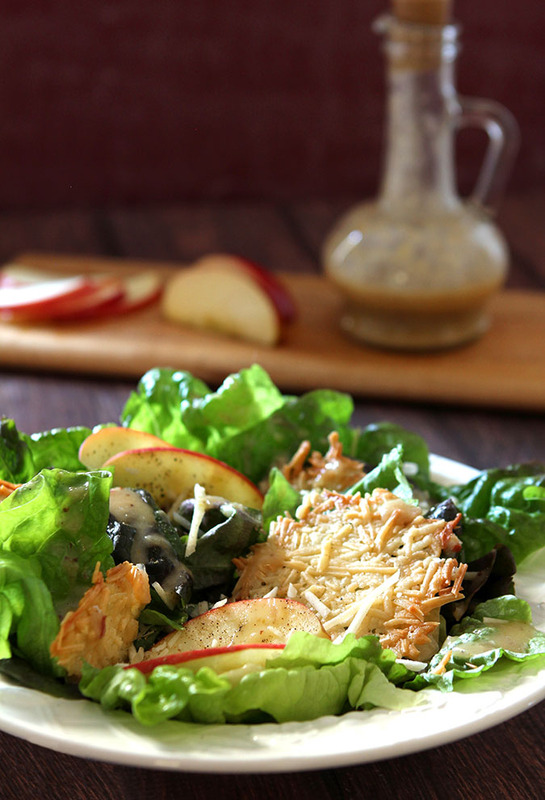 Plate salad greens; add apple slices and Parmesan crisps and drizzle with dressing. This looks great! Where is the recipe for the parmesan crisps? They look great! This salad looks so simple but refreshing! The recipe includes how to make the Parmesan crisps. They are perfect for these Shannon…no sticking at all! And the dressing? It’s now on my regular rotation; it was perfect for lots of salads; I’ve even got another coming up soon with flank steak, tomatoes and pine nuts and just used the same one. Umm umm good! This is my kind of salad! Can’t wait to try that dressing! The dressing is so good Rachel that I already know it’s going to be a standard around here; I just LOVE it! This salad looks perfect for winter! I love the addition of sweet apples and those Parmesan crisp are calling my name like you don’t even know. BUT it’s the dressing that is really speaking to me. I could put that on everything!!! I felt the same way and in a turn of events that I would say is not really normal I made another salad last night with flank steak, grilled onions, cherry tomatoes and pine nuts that I’m blogging about…and I used the same dressing. It’s definitely a keeper! Barb, I promise I’ll make the salad (so don’t call the nutrition police on me please), but honestly it’s the parmesan crisps that really caught my attention. Oh my goodness those look fabulous. I’m almost afraid to try them; I make a pile of them, they’ll all be gone before I can serve them to someone else. I wish I could give you some assurances but I would be a liar. I made double the recipe so I could nosh during the shoot. And then I made some more. And I ate them. I make homemade dressings for us around here, too. Yours sounds so good! The zingy dressing with the crisp apple and salty Parmesan crisp in each bite–salad perfection! They are so easy aren’t they Jean; I think it’s just changing habits more than anything. And yes, this really was salad perfection! I love this salad! I love the idea of using cheese crisps in place of croutons! Genius! I am now craving this salad and especially those parmesan crisps! Your bourbon nuts would be wonderful in this! Salads sound like a good way to start off a healthy new year. I feel like Jan 1 just happened and apparently the rest of the world has moved along to February!! I started to say that I would try these parmesan crisps the next time I have company…but who am I kidding– I’d much rather make it (and eat it all!) for myself! Thanks, Barb! They are so easy and so good and really added such a terrific element to this salad. I had a couple more last night in another salad with flank steak. They are addictive!